It's the monsoon season and it's been raining a lot for the last few days. The weather has been turned a bit chilly now. I love rainy days (See: Pluviophilic.) It's the perfect weather to curl up inside my book reading fort with a mug of hot chocolate or watch my favorite series with a hot bowl of soup-based dishes. 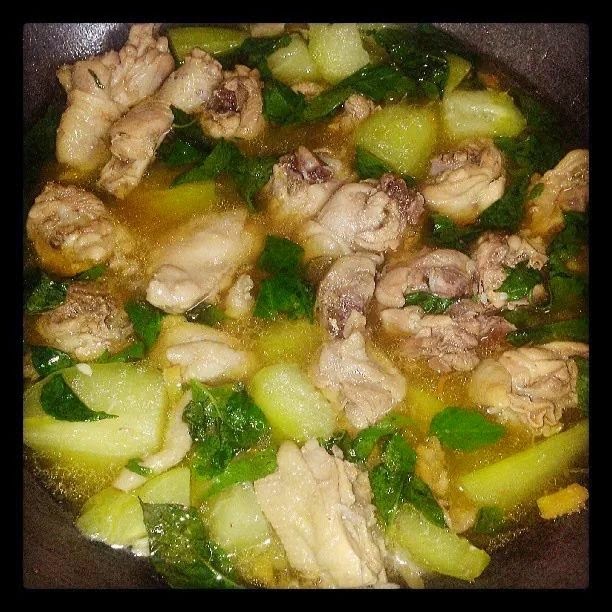 So I took advantage of the weather to cook one of my favorite Filipino food, Chicken Tinola. And here I am, sharing the recipe. 1. Saute the garlic, onion, and ginger. 2. Put the chicken in and add a tablespoon of fish sauce. Make sure you mix it evenly. 4. Put half a liter of water then add two tablespoons of fish sauce. Let simmer for 15 minutes. 5. Pour a liter of water then bring to a boil. Let simmer for at least 30 minutes. 6. Add the sayote and simmer until the sayote are tender. 7. Throw in the chili pepper leaves and continue to simmer for about 2 minutes. I hope you enjoy this Filipino classic recipe.